It is universally true that a sales representative is the ultimate fuel to organizational growth and success! He/she has the unique ability to generate and qualify leads independently. Even if a full-fledged organization has 100+ knowledgeable employees from different fields, it wouldn’t be able to survive in the market for long without a team of qualified, trained and hardworking sales representatives. 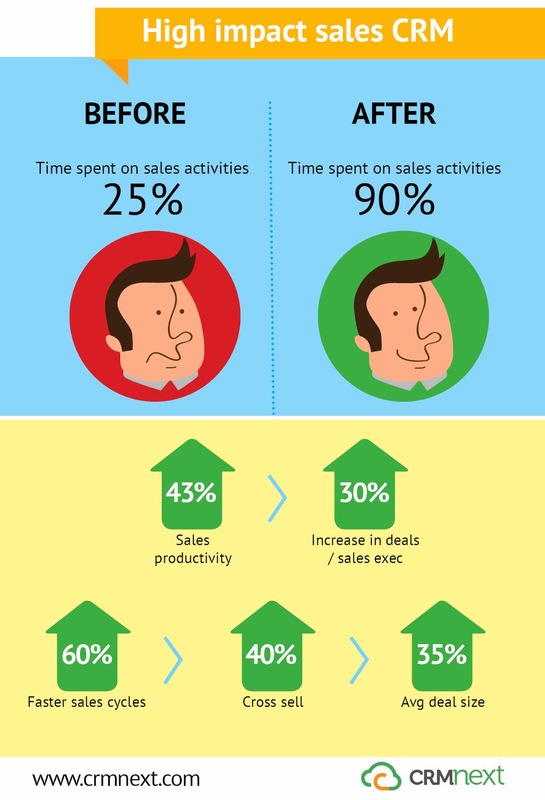 The sales performance will only get better with a high-impact cloud CRM software. In today’s competitive market environment, it is an inevitable business essential. A sales rep has to deal with several potential leads and customers everyday. For this, it is important for him to have all the information pertaining to the customer at his fingertips. A CRM system provides a comprehensive 360 degree view of all the customers on a real time basis. All the required information relating to the customers’ credit holding, past purchase history, contact details, etc. is readily available on the fly. With the help of this information sales reps’ can pitch for a potential cross sell and upsell. It will also allow reps to easily transform potential leads to customers. Instead of having mountains of customer information, reps will have a complete picture, thereby helping them create stronger relationships with customers. With real-time pipeline visibility, sales reps will be able to easily view the opportunities available in the market. It will also help them to accurately predict the required leads that are needed to meet the annual target. It also empowers the sales rep with clear knowledge about the sales productivity and also helps them to identify, focus on different products, solutions, geographies and business units, which will provide maximum output. Guided selling will provide front-end sales teams with access to step-by-step information on product sales based on the customer queries and profile. Reps will be able to make informed decisions and optimize rapport building with customers, while at the same time execute a sales call script. Through guided selling functionality, sales representatives will be able to offer the best products to customers, reduce cycle time, increases close rates and profits through effective cross sell and upsell. Through a CRM software, sales reps’ can share documents and valuable insights with other team members in real-time. With the collaboration tool, sales reps’ can easily track and share hot opportunities, history of recent activities and other information needed to engage with customers. This is the best way to make use of CRM to boost sales. Reps can get accurate forecasts based on current pipeline and performance history. With the help of forecasts, they will get a firm idea of what to expect in the coming months. Based on that idea, they will be able to plan, strategize and execute the best sales pitch. In this manner, they will utilize CRM to increase sales. From a simple perspective, a CRM implementation gives wings to a sales rep to perform exponentially. By adopting the right methodology and strategy to boost sales, organizations can handle complicated business processes and tasks with ease.